This system supports 2 GB of RAM (2×1 GB Modules) however 4 GB RAM (2×2 GB Modules) has been reported to work. This can also be purchased using the affiliate link above. I am running Windows 7 SP1 64-bit on my Dell Inspiron 1501 with 4GB RAM (3.87 useable) and a Kingston V300 240GB SSD. All of the 64-bit drivers are working fine. Here’s my problem: I want a true AHCI SATA controller so that I can use the SSD utilities and improve access times, and I want to install the full 8GB of RAM supported by the chipset. FastMHz described a hack for installing the AHCI SATA controller on the Inspiron 1501 by editing the .inf file for the XP 64-bit AHCI installer to include the 1501 hardware; this does not work under Windows 7, however. User 75616 on superuser.com described the installation of 8GB RAM (7.68 useable) on an Inspiron 1501 running Windows 7 64 bit. I tried installing two 4GB SODIMM PC2-4200 RAM cards (the maximum rate supported by the front-side bus), but the system would not boot. With a working 2GB card in slot 1 and a 4GB card in slot 2, the BIOS gives the beep code for a RAM addressing failure on boot. I have the installer for the full Windows 7 64-bit chipset device software for both the RS485M Northbridge and the SB600 Southbridge chipsets made by AMD/ATI, but the installation only results in an AHCI emulator under the 32-bit IDE controller, and it has no effect on the RAM. The problem appears to arise because the 2.6.3 BIOS does not provide SATA settings or access to the AMD address map configuration, so the chipset device software installer defaults to 32-bit IDE; I’m not sure why it won’t recognize 4GB RAM modules, but this also may be related to the settings on installation. Using the Windows 7 64-bit chipset device software, it should be possible to access the full capabilities of the chipset. I don’t know how to force the installer to do perform the requisite installations, however. I tried editing the .config file in the appropriate section, but I may not have used the right hardware code and nothing changed. Do you have any insight into either problem? I’m worried that without RAID0 and TRIM my SSD will suffer, and I would like to bump the RAM to the limit because I’m using the laptop for very processing intensive tasks. I’ll gladly send you the complete ATI chipset driver installer (which is extremely difficult to track down) if you have any interest. I have read reports of 4 GB of RAM but not 8 GB of RAM on this system. I would say you have pretty much maxed the system out besides a possible processor upgrade. I don’t know much about the credibility of the workarounds you are listing and they haven’t came to the Dell Community Forums. Likely if they worked a Dell inspiron 1501 would have reported success on the Dell Forums. To be honest the cost of 2×4 GB DDR2 RAM modules is not worth the price of the rest of the systems hardware especially as DDR2 prices have shot up and you will get little benefit as you already have a SSD installed. The processor and graphics will bottleneck this systems performance. The SSD will never run up to SATA 3 speeds on this system and while it will speed the system up significantly it won’t run at full speed with this system. Simply installing and modifying a chipset driver shouldn’t allow additional SATA operations, you would need a BIOS update to change these. Moreover you can’t wait till the OS is loaded to change the RAM, if you can’t boot with more then 4 GB of RAM then its not possible or the BIOS needed updated/modded. Using a modded BIOS update is extremely risky and hence I won’t list any here even if they are reported to work. Currently amd.com returns error messages instead of links if you follow these directions on getting the graphics drivers. But if you append &RenderOnServer=true to the search result link you should get the links. Works for me at least. Correction. These error messages I told about happened because of my own misconfiguration and it’s unlikely you’ll get them. Sorry. Good to know, but I already managed to locate the full and latest 64-bit chipset device software on a foreign website; all the named links are dead, so somebody (AMD) is purging second party sources for some reason. The problem I have is that the installer only loads the IDE SATA-emulation software –, not native 64-bit AHCI SATA — which is what I need for proper SSD function (probably because the BIOS doesn’t show AHCI support) . If I knew how to spoof this support in the installer config files,, as MHz did by editing the inf files for the AHCI driver install under Vista, I’m sure there would be no problem, but I’m not knowledgable enough to do this for Windows 7. That’s what I’m asking: How do I trick the installer for the AMD Win-7 64-bit chipset software to enable AHCI given the limitation of the 2.6.3 BIOS on an Inspiron 1501? Probably if I went back to XP, did a 64-bit Vista install and enabled AHCI using the method MHz describes, then upgraded to Windows 76 64-bit, the AHCI drivers would load automatically from the Windows 7 installer, but since I’m starting with a clean install on an SSD that is not supported under XP, I’m stuck. My mother did not want to part ways with this laptop so back in 2013 I did some big upgrades that improved the performance of this laptop. I upgraded the Processor to a AMD Turion 64 X2 Dual-Core 2.3GHz TL-66, 4GB of Ram, 64GB SSD Drive, upgraded the old wifi A & B chip to a G one and of course Windows 8.1 x64. This laptop now flies! Good for you! You have the same configuration as me, except I opted for a 256GB SSD. Yup only AHCI support for me as well. Any ideas why my up and down , side to side arrows don’t work? I have try 2 different keyboards. same problem guys. please let me know if you found anything. i need modded drivers for AHCI functionality in windows 8 pro 64 bit. any idea? i need just the %DESC% line to add to an existing driver file. something… please. its running “standard Dual Channel PCI/IDE Controller” driver. correction. I mean to say Windows 8.1 Pro, 64-bit. Anybody is having issues with Windows 8.1 where sometimes it just loads in a black screen with a mouse cursor? I solved the AHCI problem some time ago. You need to install the AHCI driver for the SouthBridge chip set — Windows will not do it for you because of the limitations of the 2.6.3 BIOS. Go online and look for “RAID Win 7 SB600” I have a copy I can distribute if anybody knows how. and set the start value to “0” which enables AHCI mode. That should do it. I think I checked in “add new hardware” to verify that the driver was installed. Not sure this works under Win 8, but I suspect it does. At the very worst, you might have to install the AHCI driver under Win 7, then upgrade. FWIW, with the 2.3GHz Turion processor, 4GB RAM, an SSD running in AHCI mode, and the appropriate tweaks to optimize Win 7, the Inspiron 1501 is very nearly as fast as any modern Dell. Gary are you having any issues where sometimes it just loads in a black screen with a mouse cursor? Frank, I had the documented problem of Win 7 not loading the 64-bit ATI Radeon display drivers, giving a VGA screen, but never a black screen. The driver-discovery problem is solved by running the Windows Experience utility in the control panel — when it performs the graphics metrics, this somehow triggers discovery of the new display drivers. My only suggestion is to make sure you’ve got the proper 64-bit display drivers installed, then run the Windows Experience utility. may you’ll be so kind to describe how to install the AHCI driver for the SouthBridge? I’ve got ahcix64s.inf and sys files but what should I do with them? I apologize for not being more specific, but I did the AHCI hack a while back when I was trying a lot of different approaches, and I didn’t document exactly what I did that worked. After I found the actual AHCI driver — RAID Win7 SB600 — I think I looked around in the system files and found a reasonable place to place it (the installer file might have done this for me), then I opened the utility in the control panel that lets you add new hardware and went through the rigamarole of telling the OS that I had installed new hardware (e.g., the SSD) and that i would show it where the driver software was. Then I navigated in the menu to the location where I (or the installer) had placed the file, and selected that file as the new driver. After I was done, I could open the control panel that displays all the installed hardware, and verify that the AHCI driver showed up under the hard drives heading (along with the IDE/SATA bridge, etc.). As I mentioned, you also need to edit the registry to tell the OS to use AHCI mode. The process is very similar to adding new hardware in XP, but finding the entry point is a little harder. Also, you do need the AHCI driver itself to modify an existing Win 7 installation — the inf file is basically a set of instructions for an installer that provides information about the files it should look for during installation, not the software files themselves. If you’re savvy and your doing a fresh Win 7 install, there may be a way to use the inf file to trick the Win7 installer into installing AHCI drivers on the Inspiron, but that’s another project. As I mentioned, I have the RAID Win7 SB600 driver file. I also have the 64-bit Win7 software update for both the SouthBridge and Northbridge chip sets — I updated these as well (which also might have installed the AHC drivers). I would gladly share all these files, if there’s a way to do so. And yes I tried to start a new Win7 installation and select an ahcix64s driver (actually 4 or 5 variants from Internet:) while connecting to SSD storage on the very early stage of install process. Nope, no appropriate drivers found. I suppose the point is the proper driver. Maybe you could upload your files to GoogleDisk or Dropbox and publish here a link? I’d appreciate that. Can you tell me please do you have such a driver signature issue on your system, and if not – can you look up your sys file properties (c:\windows\system32\drivers\ahcix64s.sys) and tell me is your driver signed with embedded signature or not. Wow, bingo! I did it. This driver is signed with embedded signature and causes no problems with Win7. Yuri, That’s great. Do you have any insight into how to upgrade the Inspiron 1501 to 8GB RAM? The chipset supports it but the BIOS doesn’t. People have successfully installed 8GB RAM on the 1501 running XP Pro x64 (neill808 on the Dell Community Website under “Inspiron 1501 memory limits”), but I tried on Win7 Pro x64 (with 2x4GB non-parity non-ECC DDR2 PC2-4200 200-pin SODIMM) and the system wouldn’t boot. There must be hidden BIOS settings that they somehow changed when they did their x64 OS install. Yuri, I didn’t have the driver signature problem when I did the installation earlier this year; I gave the Inspiron to my nephew, so I don’t have direct access to it right now. I can try asking him to check the sys file next time i talk to him. I believe the problem you’re having is something new that began this Spring when Microsoft started pushing Win10 and changed it’s software policies: I tried to do a clean Win 7 install into a BootCamp partition on a Mac running OS X Yosemite a couple of months ago, and ALL of the drivers that the BootCamp installer loaded had the same unsigned-signature problem you describe. Apple support told me that this is Microsoft’s doing — Microsoft pulled the plug on iso replacements for Windows installations provided by second-party vendors such as Apple and Dell and began strictly policing all OS installations. I got around this problem on the Mac by doing the Win7 installation into a VirtualBox VM under OS X, finding an earlier archived build of the Win7 drivers for BootCamp and installing the archived drivers in the VM, then I cloned the Win7 installation in the VM and copied my custom iso into the BootCamp partition. That worked. BTW, I didn’t edit an inf file when I installed the AHCI driver. Is it possible that when I did the SouthBridge 600 chipset software upgrade that it loaded the AHCI driver and Microsoft accepted the software signature for the package? It’s either that, or I got lucky and did my installation before Microsoft cracked down. You know I also have a Studio 1535 laptop and just a few months ago I succesfully installed 8 Gb on it. But I never tried to do it with 1501. Are you sure the problem is not in your SODIMMs? Sometimes they are incompatible even if all the specs are ok. What happen if you plug only 1 4Gb SODIMM having second slot empty? Thanks for your prompt reply. I tried one 4GB RAM chip and had the same problem — on boot, the computer issued a couple of chimes, the screen remained black, and the processor & RAM heated up very quickly. I had to purchase the 4GB RAM chips, so I didn’t have a variety to choose among, but the specs were all correct. If you go the down the road of trying to max out the RAM on your Inspiron, let me now what you find out. If the chipset supports 8GB RAM and people successfully installed 8GB under XP PRO x64, it has to be something like a backdoor BIOS setting that isn’t directly accessible to the user. For Quickset, use http://downloads.dell.com/app/R147697.EXE and run in compatibility mode for Vista. Tested with Windows 10 64-bit. Lex, are you successfully running Windows 10 64 bit on the Inspiron 1501? I’m considuering updating from Windows 7 64 bit. Thanks for all of the information here Gary and Yuri. This makes perfect sense, I have the Inspiron 1501 I am working on for a family member, and I’ve upgraded the computer to a Samsung SSD. So far it sounds like the below steps will allow my Windows 8 OS to utilize AHCI capabilities on the machine. 1. Install the SB600 AHCI RAID driver. My only question is that I still cannot modify AHCI mode in the BIOS itself since this is a locked setting in the BIOS. So even if I save the OS in AHCI mode, will the computer still boot successfully and load the AHCI drivers on the next startup? I take it once it is changed on the machine, I cannot go back because of the BIOS limitations. So I’m just making sure, please let me know if there is anything else I would need to do beyond the steps that have been mentioned. You can use AS SSD Benchmark tool to see if you are really running AHCI driver or not. If you change the Registry setting to AHCI, then that’s the mode it will use. I haven’t tested the AHCI driver under Windows 8, but I presume it’s still good. As Yuri discovered, since Microsoft began strict policy enforcement earlier this your, you have to make sure you get a signed copy of the SB600 AHCI driver (which Yuri has). And even though Windows 8 provides native SSD support, when you’re up and running I would still check to make sure TRIM is enabled and disk defragmentation disabled. There also are a couple of settings tweaks that will speed performance, like disabling disk indexing and paging files. Thanks for the quick replies. I definitely cannot switch to AHCI mode by simply modifying the registry, and restarting the computer. Windows 8 appears to be smart enough to change it back to IDE/ATA after the computer starts. I also haven’t successfully installed the driver just yet. Can installing the most recent version first through device manager (3.2.1540.17) or do I need to install the older version first (1.17.50.2)? Sorry for being such a noob, I think I get the main concept, I spent about an hour on this last night before just giving up. Your Windows changes your registry back cause you have no appropriate AHCI drivers installed. Win7 has just the same behaviour. As far as I can remember you should add this string to inf file and try to install the driver then. Yes, you can do it through device manager in manual mode or with setup.exe from driver package. Hi Yuri. How exactly did you install the driver through the device manager? Could you give clear steps on how you did this? Add legacy hardware and..? Also, what driver package are you talking about? All I downloaded was the SB600 AHCI RAID driver (ahcix64s.inf and ahcix64s.sys) from the gigabyte link you posted. Hi Yuri. 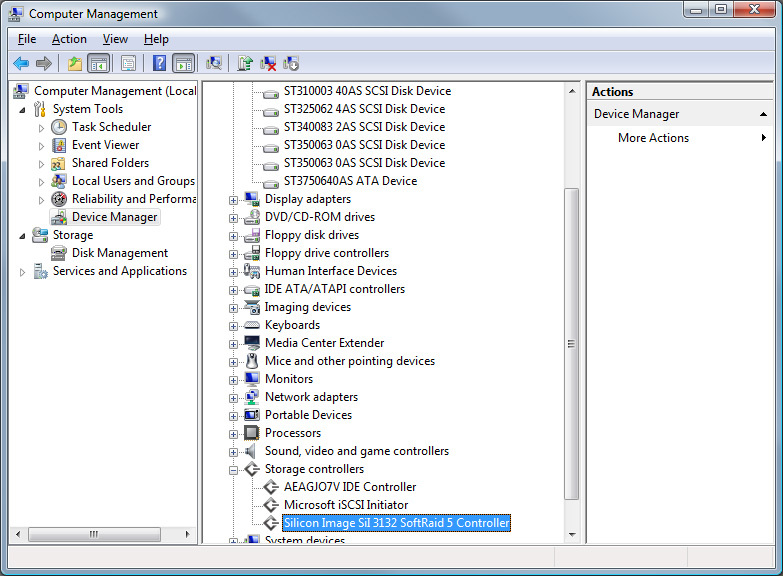 Could you explain in detail how to install the SB600 AHCI driver through device manager? Add legacy hardware and..? Also what “driver package” are you talking about? I only downloaded the SB600 AHCI driver (ahcix64s.inf and ahcix64s.sys) from the gigabyte link you posted. I’ve installed an unsigned driver first. Then I’ve upgraded it with signed driver from gigabyte site. 0. IMPORTANT! Backup you system/make a point of recovery. 3. Try to install driver – Add legacy hw, yes; select manual mode, select Storage controllers, it has an icon like “C-” (like here http://www.mediasmartserver.net/blog/wp-content/uploads/2009/01/devicemanager.jpg), then press “install from disk” and specify the folder with you ahcix64.cat, sys and modded inf files. 6. If you engage any problems booting yous system – restore from the last recovery point (see Step 0). If it doesn’t work you may try to use “Chipset Driver (include sata raid driver)” package from gigabyte site, it should install SB600 drivers too I hope. But don’t forget to backup you system before! Is that correct? Also, should I have put the .sys file in Windows\System32\drivers folder? I also downloaded Gary’s unsigned driver from the wikisend link he posted (I figured I install that first like you), but it requires a password to unzip. It looks correct but maybe I’ve forgotten smth. I should inspect my Inspiron and return back to you. Try to modify inf file as I wrote, install this driver – it should install but it’s unsigned, and try to update it with gigabyte driver then (maybe it is not necessary to mod inf file in this case). You should first unzip RAIDatiSB600_Vista.zip and install it. Inf file in /x64 folder is already modded. Then you should update your AHCI driver with gigabyte’s one from motherboard_xxxx.exe pack. PNG shows how it looks in my device manager. What chipset did you update to/install? I updated/installed the Ricoh Card Reader that’s on this page. Maybe that’s the problem? I was referring to the ASUS chipset software update for both the Northbridge and Southbridge motherboard chipsets. SB600 in your AHCI driver name refers to the Southbridge chipset (which is the chipset update that would impact the AHCI driver), but the installer I have contains both (I think NB and SB refer to the front-side and backside of the architecture). The NB600 and SB600 chipsets were used for many later models than the Inspiron 1501, which was a transitional model between 32B and 64B applications. Because of the chipsets, it is capable of much more 64-bit native processing than Dell ever supported — as well as 8GB RAM addressing — which is why one has to scrounge to find the appropriate 64B drivers. I’ve got the last chipset software update for the ASUS NB600 and SB600 chipsets, which was VERY hard to find — it was pulled from every repository, including the vendor’s site. I could post the installer on one of the file-sharing sites if you want to give it a try, but given the problems that Microsoft created for unsigned drivers when it decided to release Windows 10, I can’t guarantee whether this update will install or not. I also don’t know whether this will fix the problem you’re having. I was lucky — I did my Win7 upgrade on the Inspiron 1501 just before Microsoft went medieval on policies. Hi Gary. Yeah I’ll give the chipset software a shot. Also, do you know if AHCI is supported under Linux for the Inspiron 1501? I installed Ubuntu 14.1 on a second SSD for my 1501. Not only does it support AHCI, it is optimized for the AMD processor line, and the Ubuntu installer automatically located and installed all the 64-bit drivers needed by the 1501. Way less painful than the Windows 7 hack and very fast. Frankly, I like the 1501 much better as a Linux machine than a Windows machine — I just need the Windows 7 drive to host some legacy software. I noticed in reviewing the thread that Yuri previously had posted a link to the chipset software updater at an active repository — at least the SouthBridge updater, which is all you should need to support the SSD bus. There’s a better chance that Yuri’s version is signed than there is for my version. See if that link is still good, and let me know how that works out. Meanwhile, I’ll look around to see where I archived the full chipset installer and try to upload it to a file-share site. Give me a day or two. This is the way i successfully installed ahci driver under windows 7×64 ultimate ed. – open device manager, click on storage controller, right-click on “AMD AHCI Compatible RAID Controller”, select update driver. Select manual mode and find ahcix64s file you modified before. – when modification is done, reboot and enjoy. Inspiron 1501 is an old computer but win7 runs very fast with this configuration. Many thanks to Yuri and all. Hello! Thanks so much for all the info you have provided here! 2. In my case, Vista’s drivers where not so good (some more about it later), therefore I have used Windows7 drivers (https://pl.msi.com/Motherboard/support/K9A_Platinum#down-driver&Win7%2064). I had to use Vista’s installer (AsusSetup.exe) to install them (just overwrite driver files). Manually selected driver update didn’t work in my case. 4. That’s not all! Because now AHCI mode is on, but without NCQ mode, AS SSD shows only 199 points. 5. Get ATI’s RAIDXpert 3.3.1540.19 (http://support.amd.com/en-us/download/chipset?os=Windows%20Vista%20-%2064) and install it. 7. NOW it runs, AS SSD gives nice 432 points. As for Vista drivers, they worked but somehow boot was slow and system log showed “Task e7 timeout on disk” errors. Even with NCQ AS SSD showed only 275 points. Oh, and one more thing – for some reason, RAIDXpert service must be disabled after setting NCQ in order to get full performance.